Nitrogen compounds from power plants, automobiles and agriculture are being carried to remote areas of Rocky Mountain National Park, altering sensitive ecosystems and changing alpine vegetation, according to scientists. Isabel Ashton (left) and John Murgel analyze vegetation changes caused by atmospheric nitrogen pollution in Rocky Mountain NP. While the changes remain subtle to date, they are important because they represent a first step in a series of changes which may be irreversible, said University of Colorado Boulder professor William Bowman, who directs CU-Boulder’s Mountain Research Station and led a study into the nitrogen pollution at the national park. Elsewhere, higher amounts of nitrogen pollutants correlate with decreased biodiversity, acidified soils and dead stream organisms like trout, said Bowman. The study site was an alpine meadow about one mile east of Chapin Pass in the Mummy Range of Rocky Mountain National Park. Bowman and his team analyzed plant communities and soils under ambient levels of nitrogen deposition and compared them to plots with added nitrogen to simulate the increasing atmospheric nitrogen pollution expected in the coming decades. The results indicated changes in plant abundances already were occurring under ambient conditions. No changes in soils were detected. During the three-year study, rising levels of nitrogen in the soils correlated with large increases in a common species of sedge shown to flourish in other nitrogen addition studies. Bowman’s team anticipates that the diversity of vascular plant species will rise with increasing nitrogen deposition, then decrease with more rare species being excluded by competition from other plant species. 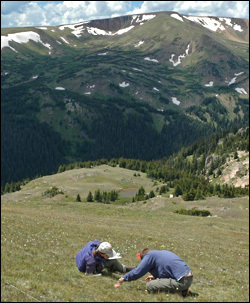 Previous studies by Bowman and others have shown vegetation changes and soil acidification has been occurring due to increasing nitrogen deposition at other alpine sites in Colorado, including Niwot Ridge. Given the projected population growth in Front Range cities in the greater Denver area and increasing agricultural development, nitrogen deposition is expected to increase steadily in Rocky Mountain National Park over the next several decades, said Bowman. The high-elevation ecosystems of the park are home to plants and animals well adapted to the severe climate above treeline, but they are the most sensitive to adverse impacts from air pollutants, Bowman pointed out. Previous studies documented ongoing changes in the algae in Rocky Mountain National Park’s high elevation lakes due to nitrogen pollution. Continued inputs of nitrogen pollutants are a hazard to the health of both trout and their food sources, specifically when the ability of the land plants and soils to take up the nitrogen is exceeded, causing soils to become acidified. Other parts of the Colorado Front Range have exhibited signs of acidification at the highest elevations, resulting in the leaching of soluble aluminum from soils, eventually migrating to streams and lakes, where aluminum toxicity effects many aquatic animals, he said. Environmental Defense and Trout Unlimited petitioned the state of Colorado and the U.S. Environmental Protection Agency to reduce emissions of nitrogen pollution in 2004. This effort resulted in a 2007 plan to lower nitrogen emissions on a voluntary basis to reduce impacts to Rocky Mountain National Park. The local power utility’s recent switch to natural gas in some of its power plants is one of many steps toward limiting nitrogen emissions, said Bowman. Ongoing efforts by air quality managers and representatives from the Colorado agricultural industry are also working on management practices that would lower nitrogen emissions. A paper on the research was published in the June issue of the Journal of Environmental Management.